This is the easiest Vanilla Ice Cream Recipe you’ll ever make. You can add fresh fruit or chocolate if you like flavored ice cream! This recipe uses raw eggs. It is not recommended for pregnant women, young children, the elderly and the infirm do not consume raw eggs. 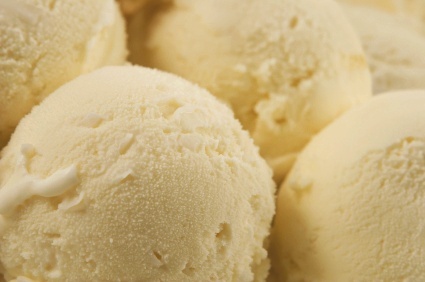 Be sure to use only fresh eggs for this Homemade Vanilla Ice Cream Recipe. Pls review this recipe below. Thank you. Mix the sugar and Karo syrup with an electric or hand rotary beater. Add one egg at a time, mixing completely after each one. Add 1 quart of Half-n-Half and mix thoroughly. Optional: At this point you can add fresh fruit or chocolate if you like flavored ice cream. Pour into the metal can from the ice cream maker, also put in the paddle thing. Add enough of the 2nd quart of Half-n-Half to the fill line mark. Put the can into the outside bucket, pack chunks of ice and rock salt (do in layers of about 2" inches of ice then 2-3 handfuls of salt). Turn on the ice cream maker and let it go until done. gonna try this ice cream recipe tonite!!! hehe..